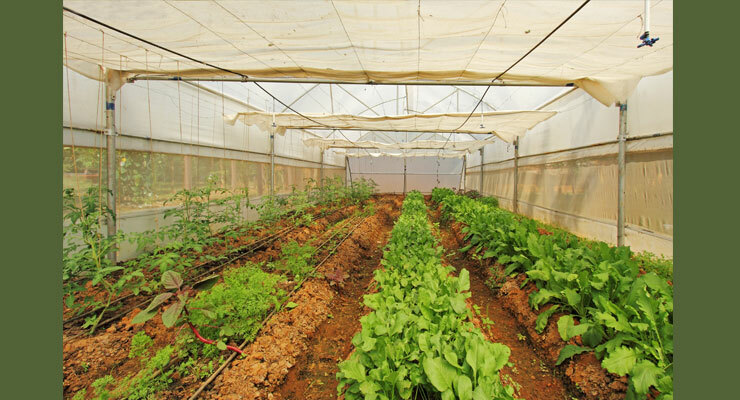 Our organic farm, the eco- friendly Monsoon Forest spread over two greenhouses consist of vegetables, for a perfect dining experience with our organic vegetables. Stroll into the canopied shed and you can see the columns of plants bearing cucumbers, gourds, lady’s finger and variety of other vegetables. The drip system is turned on to water these vegetables. As you stroll around inside the greenhouse mist of water droplets covers you. Another nursery project to develop some more greens- fresh salads, green leafy vegetables and cherry tomatoes. There is a profound connection between the food we eat and our body. What we eat, makes our body decides the nature of living a healthy lifestyle. Something not you, gets to be you. Eating food is an enormous plausibility to experience union. That is the reason why in our culture we have been advised to eat with awareness, full focus and most importantly peacefully. At Monsoon Forest, we have perceived how nature and people can without much of a stretch coincide in amicability, supporting each other. Nature in its outmost divinity and its creatures are all holy.